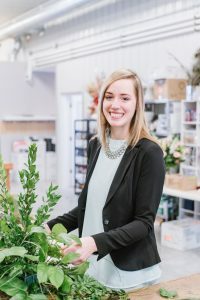 Passionate about art, gardening and landscaping, Annie brings strong experience in landscape, greenhouse work, and visual merchandising to our team. Annie is a CNA and has earned her Associates Degree from Rock Valley College. She is a program volunteer at GiGi’s Playhouse and is an avid artist, designing and painting large-scale murals and hand-drawn greeting cards. Annie is currently pursuing her degree in Landscape Design at Kishwaukee College. She is looking forward to learning more about event design and floral arranging.